Innovations in dentistry have made tooth restoration more accurate and convenient, not to mention less time-consuming. 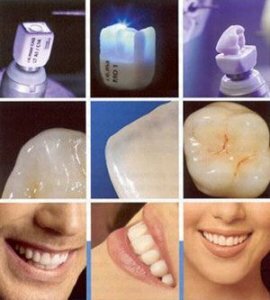 Same day crowns using CEREC technology is a shining example. For teeth that are decayed, infected, broken, or weakened, patients can now have a custom-fit crown in one visit. 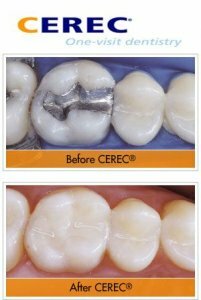 CEREC same day crowns allow dentists to shape and color your restoration to blend flawlessly with your natural teeth, while restoring the function and confidence you deserve. 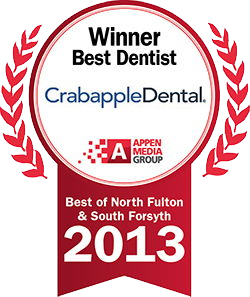 As a leading cosmetic dentist, Dr. Sarah Roberts incorporates CEREC instruments to provide a unique level of care to patients at Crabapple Dental. Using CAD|CAM technology, an optical impression is made of the damaged tooth. Through computer design software, a specialized image of the new restoration is created. A milling machine manufactures the new design, and it is bonded to the old tooth. As a highly creative and predictable service, it’s easy to see why CEREC same day crowns are on the cutting edge of cosmetic dentistry. Traditionally, dentists place dental crowns, restorations, and other cosmetics through a series of visits. Yet, one visit dentistry provides a better solution to achieving a successful result. Patients can forego having messy impressions and wearing temporary crowns until their final restoration is complete. 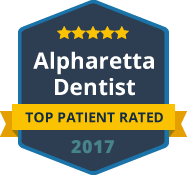 As a convenient and timesaving process, one visit dentistry is quickly becoming the method of choice for dentists and patients alike. She also understands that making time for this level of care can be difficult. Thus, patients appreciate the advantages of one visit dentistry. This proven system delivers healthy, beautiful smiles in a faster and better way. Dr. Sarah Roberts invites you to experience the difference that modern technology can make by contacting Crabapple Dental today. As a CEREC dentist, Dr. Roberts leverages technological advances to help patients benefit from the best digital dental care available.